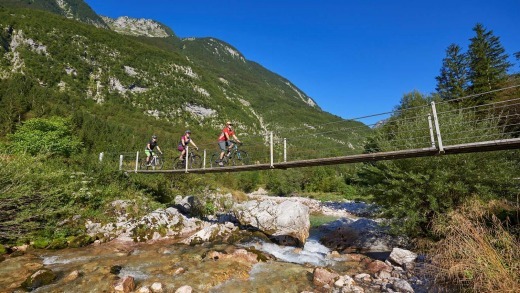 Cycling across the Soca, Slovenia. Metres from the Italian border, I pull over at a Slovenian roadside food stall because it feels like a good thing to do. A 40-something Montenegrin mans the stand. He and the other locals there are amazed to meet a cycling Australian and, before long, I'm handed a plastic cup of homemade wine. Zoran, meanwhile, carves slices of red capsicum and fresh cheese and cured pork – one of them made from the meat around the throat of wild boar he gestures and explains. Samples are pressed between rough-cut slices of bread and passed to me to try until I'm stuffed. My main concern, when I agreed to a self-guided cycling trip in Europe, was that it wouldn't be an adventure. I'd previously only bike toured independently – travelling alone or with a friend – on loose schedules. Plenty of time to drink coffee, eat and socialise and the freedom to stop for the night due to tiredness or simply liking the look of a place. The daily distance quotas and pre-booked hotels of a self-guided tour seemed restrictive to the way I prefer to roll. Sabadin viaduct on the Parenzana rail trail, Croatia. UTracks offer more than 130 self-guided European and UK cycling itineraries. 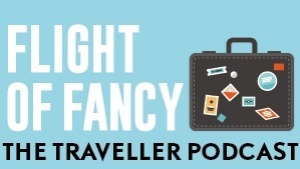 Innsbruck to Verona, the Puglia coast, lakes and castles of Sweden, mountains of Transylvania, the Pyrenees to the Med, Seine to the Thames, backroads of Provence, Bavarian Beer Trail, Berlin Wall, Scottish Highlands, Puglia, Burgundy, Algarve. Their introductory, moderate and challenging tours range between four and 24 days, but most are about a week. I instinctively looked for manageable terrain that would also push my limits, a journey rather than daytrips from a base, new territory in a favourite area and access to burek. 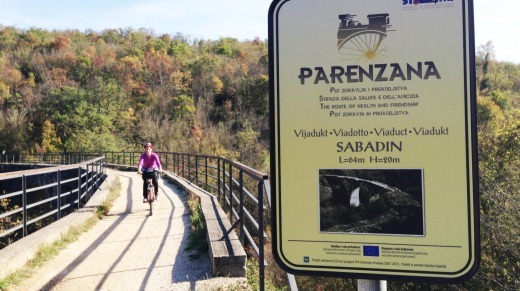 Cycle Slovenia and the Parenzana shone for me. Zoran the Montenegrin refuses to let me pay, even for the fruit I picked out before the party started. The sun hangs over the Adriatic as I pedal into Italy and the first sweeping corner down towards Trieste. This city of 200,000 is by far the largest centre on my route and, presumably, the trickiest place to find the pre-booked accommodation. I stop to check the map and a motorbike immediately pulls up alongside. A few days earlier, I'd transferred from Slovenia's capital of Ljubljana to Bled where Tina Verk provided a pre-trip briefing. An architect weathering Slovenia's building crisis, Tina bought me coffee and handed over three brand new maps with the eight-day route clearly marked plus a folder of customised information: conversationally-written daily instructions, historic site diversions, local phrases, hotel location maps and vouchers. She talked me through the week, gave me her number and left behind a sturdy aluminium frame bike, panniers and repair kit. 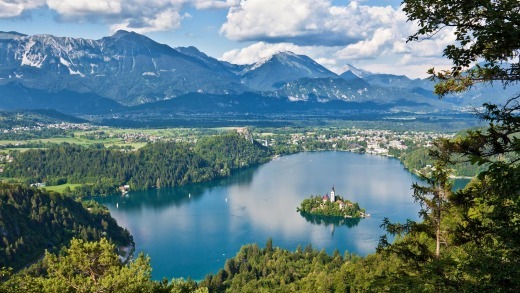 I can navigate my way across entire countries but get lost in backstreets so, the next morning, I characteristically fumbled my way out of Bled with the help of locals and another cyclist. But, by Triglav National Park, I was on track. There, the gravel road runs between forest dotted with hay barns and houses, multi-coloured bee trailers and farms selling honey and cheese. 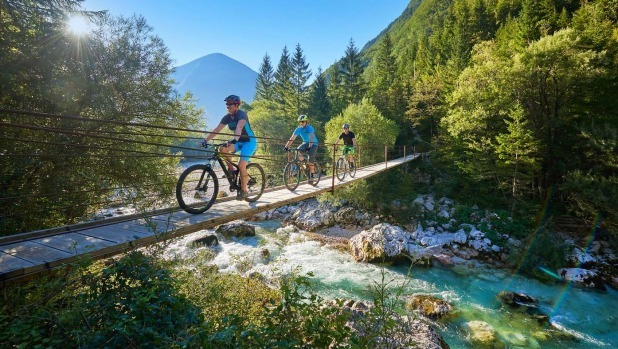 I walked my bike up the steep bitumen road that snakes from the valley floor then flew down into Mojstrana and joined a flat sealed cycle path towards the eleventh century Julian Alps town of Kranjska Gora. Over espresso and skutin burek – my favourite kind with soft salty feta between the oily layers of warm pastry – I considered the 50 kilometres behind me and imagined the road just ahead. 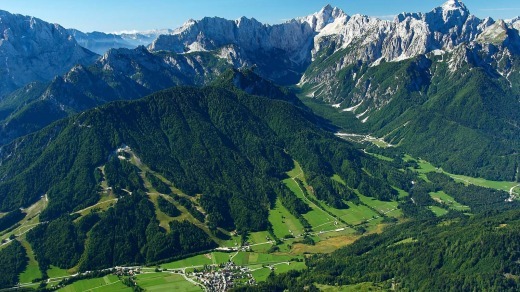 From Kranjska Gora, at an elevation of 806 metres, 50 hairpin bends take you up and over Slovenia's highest pass of 1611 metres overlooked by the county's tallest peak of Mt Triglav at 2864 metres. I licked my fingers and wheeled my bike to the town's main supermarket to meet my two o'clock introductory-to-moderate-self-guided-itinerary transfer over Vrsic Pass. By the time I reach Italy's mini-boot, wedged between the Adriatic and Slovenia's western border, I've cycled an undulating 30 to 75 kilometres each day for four days. I've also white water rafted the Soca River, taken a train from Nova Gorica to Divaca and toured the gaping limestone bowels of Skocjan Caves with a woman from the Netherlands who was in my carriage. The motorcyclist who stops beside me on Trieste's outskirts is one of the locals from the food stall fiesta. Fulvio glances at my open folder and uses such expressive body language – our spoken ones barely overlap – I understand him perfectly and cycle top speed behind the Enfield straight to Hotel Roma. Fulvio then invites me for coffee, a sunset walk on the pedestrian pier of Molo Audace, an evening motorbike ride around Trieste, gelato, wine spritzers, a wander through the fairy-light lit Piazza Unità d'Italia and, at midnight, the 70-something-year-old Italian delivers me back to my hotel. During the briefing in Bled, Tina had suggested I leave Trieste by boat and begin the Parenzana from across the bay in Muggia. The next morning, a series of simple steps lie between Hotel Roma and basking in top-deck sunshine. Muggia's marketed cobbled streets hum with the countless exchanges of ciao ciao ciao as I helmetlessly scoot through in the vague direction of the Parenzana. The Parenzana operated as a narrow-gauge railway from 1902 to 1935 linking Trieste in Italy to Porec in Croatia via Portoroz on Slovenia's 46.6-kilometre Adriatic-Mediterranean coastline. A decade ago, work began to restore the derelict route which weaves for 123 kilometres in and out of towns and villages, across six aqueducts, over 11 bridges and through eight tunnels of the Istria Peninsula. The longest tunnel is 544 metres. Here in Istria the wheat and corn crops of inland Slovenia give way to olive and fig trees and grapevines. 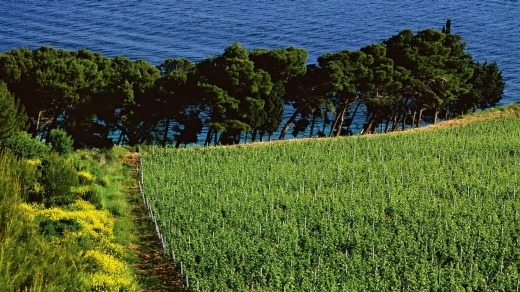 The area is also known for truffles, wild asparagus, pears, oysters, ox and cheese. The Parenzana passes backyards and between orchards and sometimes goes over a highway and through a carpark. It is concrete urban pathways and it is gravel tracks through the bush. Also called the Trail of Health and Friendship, the Parenzana rises to 293 metres and gets down to two metres above sea level. The total vertical climb of 1260 metres over three days is most noticeable after crossing into Croatia. But, despite some laboured ups, there are many long downhill sections or flat seaside stretches when, sun on my back, I can't believe this is my life. By the second last day, I'm bike-fit enough to ride up into the medieval hilltop town of Motovun. People coming down in a coach applaud. That has never happened. That night I walk the ancient elevated Motovun streets, have stracciatella ice cream in a waffle cone for dinner and sleep in an attic with the wooden shutters open to the night air and full moon. The first rain of the trip falls the next morning and I'm already on the trail when it starts to pour. I stand under a tree and eat leftover pastry from breakfast but, when I realise it isn't stopping, put on wet weather gear and go for it. Once I get cold, I take shelter in a Vizinada cafe-bar full of chatty locals who've knocked off early from work. 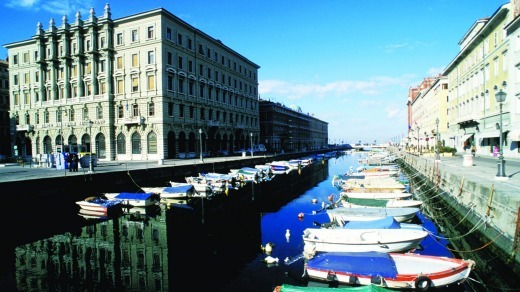 Canal Grande in Trieste, Italy. The sun comes out in the afternoon and I'm like a kid on a BMX through the rich red Istrian soil that cakes my tyres and flicks up into my hair as I pedal for the coast again, pushing myself harder than I ever have on a bike. And loving it. Julian Alps and Kranjska Gora, Slovenia. Strunjan Tunnel near Portoroz, Slovenia. 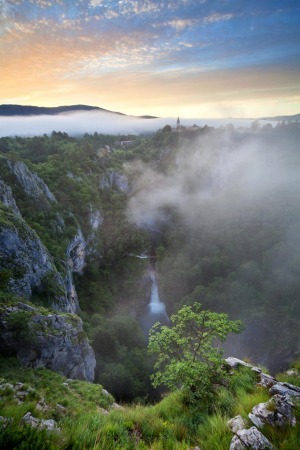 Slovenia boasts stunning natural vistas at every turn.